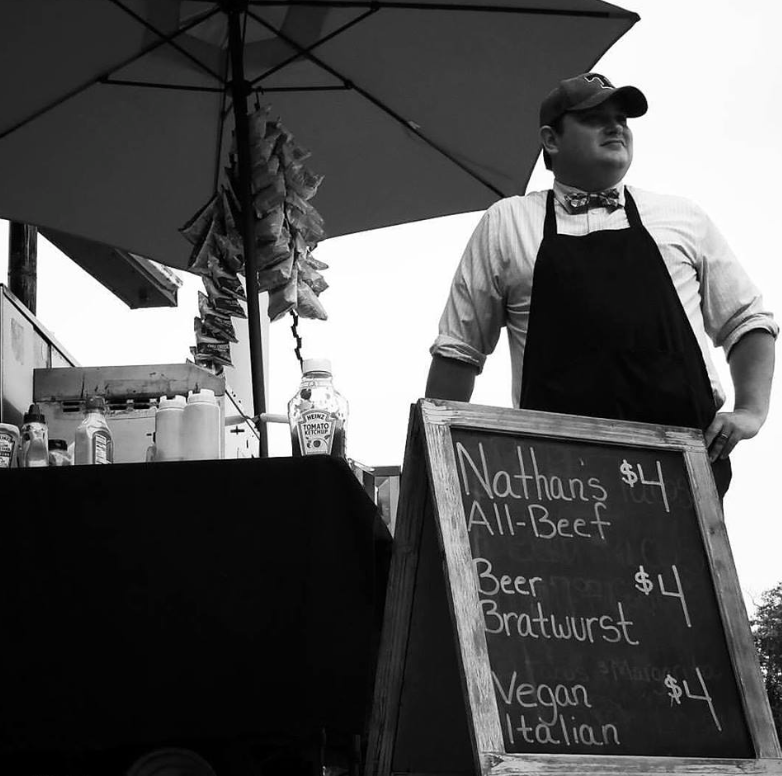 Thinking about venturing out and starting your own hot dog cart business? Look no further than this ultimate guide to give you the information you need to get started the right way. Unlike a lot of the other information you may have found published online, this advice comes straight from an active hot dog vendor Matt Gladfelter of Bow Ties and Hot Dogs. Gladfelter has been operating his hot dog cart for over a year now and actually got started in his “spare time” when he was employed full-time as a restaurant manager. He’s got family obligations just like everyone else and has made it work. In short, he understands what it takes to start a hot dog cart successfully and grow into multiple food carts if that’s the direction you would like to head as well. This guide below is broken up into different sections. You can save this page as your reference guide to starting your hot dog business. We recommend listening twice to audio accompaniment for the the Hot Dog Cart Business Planning section. Completing the process outlined in this part of the interview is critical to ensuring your set up for success and will even help you decide if this is the right business model for you. You will also get some homework to complete on your end that you should follow along with. Finally, to get the most value possible out of this guide, have a pen and notepad handy. Some of the audio guide will provide you with steps that Matt took before he actually started vending. You should follow these exact same steps if you would like to see similar results. Best of all, researching this information costs you nothing, but some time and effort on your end. Due diligence that should be completed before embarking on any type of business venture. Hot Dog Cart Business Plan & Market Research – In this the first post in our series, we cover how to organize a real business plan for your cart, build a unique brand in your area, and how to scope out the competition by doing a little market research to understand the other hot dog vendors in your area. After completing this lesson, you’ll have a lot more awareness of where hot dog carts are currently operating in your city in addition to how you’ll brand your business. Hot Dog Business Startup Costs – This is an important topic, but here’s the good news. Starting a hot dog business is probably one of the lowest cost ventures you could pursue. As you’ll learn in this post, Matt was able to start his business for under $5,000. In this post we give you a clear range of what it will cost to start a hot dog business and some of the different factors that go into determining that cost. One of the biggest factors is whether or not you decide to buy a new or used cart. Revenue Potential – This is the big question. Can a hot dog cart actually generate enough revenue to support your lifestyle? It’s important to understand revenue potential of a business before you get started so you know if this is the right type of business for you. Cutting Expenses – Do you like spending more on things than you need to? How about flushing money down the toilet? Didn’t think so. In this post, we cover specific ways you can cut costs with a hot dog business and avoid food waste. After all, at the end of the day it’s not how much you make, but how much you get to keep that matters in business. Five Smart Ways to Fund a Hot Dog Cart – Not sure how you’ll pay for that first hot dog cart? You’re not alone. In this post, we cover five frequently used methods for accumulating the scratch to buy a hot dog cart. Advantages and Disadvantages of This Business Model – As with any business model, there are pros and cons to operating this type of business. We want to be 100% transparent with you about the good and the bad so you know what you’re getting yourself into. Even though operating a hot dog stand can translate in a great living for the right person there are long hours, trial and error, weather and marketing elements that must be taken into consideration before taking the leap of faith. Hot Dog Cart Manufacturer List and Reviews – Looking for a hot dog cart? Here we’ve listed all the major manufacturers from across the United States and Canada so you can see what your options are in terms of new carts. We hope you enjoy this “ultimate” guide to breaking into the hot dog industry. If you have any questions, don’t hesitate to leave a comment below.